102. How do I really delete a directory and files in Windows? See also: How do I copy many files in Windows using Robocopy? See also: How do I start an elevated command prompt (as administrator) in Windows? Start a command prompt as a local administrator. Change directory to the one above the directory you want to delete. 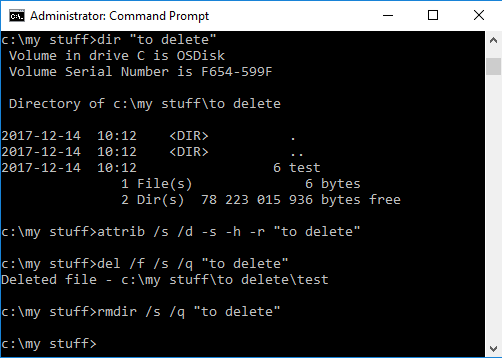 cd "c:\my stuff" attrib /s /d -s -h -r "to delete" del /f /s /q "to delete" rmdir /s /q "to delete"